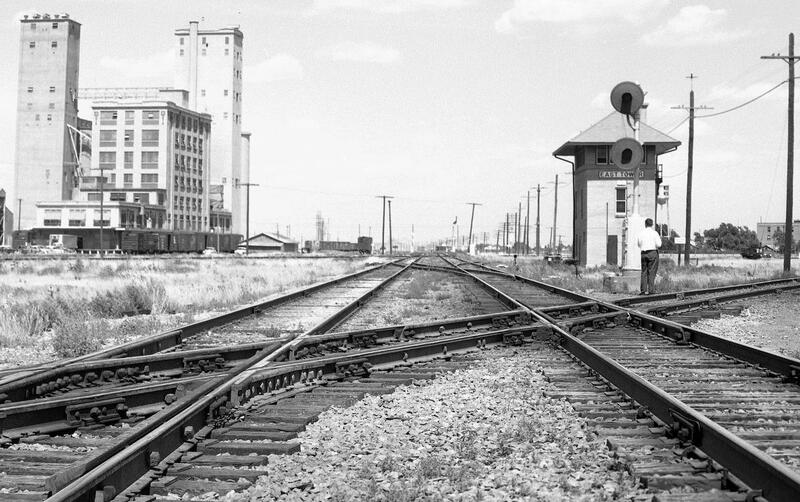 Above: Looking east along the Fort Worth and Denver (FW&D) tracks, John W Barriger III captured this photo of Tower 75 on an afternoon in the late 30s or early 40s. 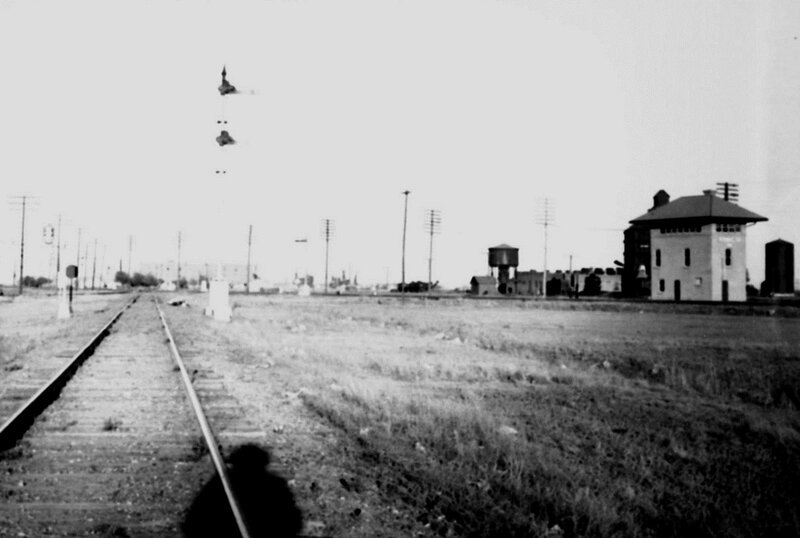 Judging by the human shadow in the foreground, Barriger was standing between the rails and not near his business car since the setting west sun had a clear view of his back. 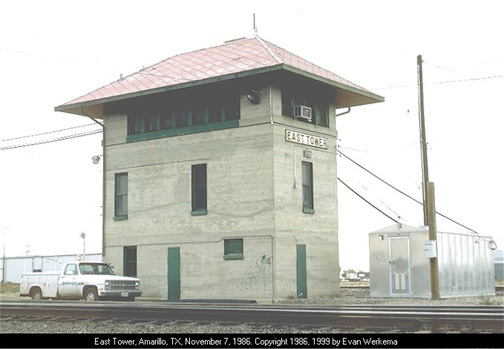 The sign on the tower says "East Tower", the moniker by which it was known to Amarillo railroaders. Below: This photo by Barriger faces east-northeast along the Santa Fe tracks. Note that searchlight signals have replaced the semaphore signal visible in the above photo, which was taken roughly two decades earlier. Amarillo was founded in 1887 by savvy businessmen looking to capitalize on a new rail line being built across the Texas Panhandle by the Fort Worth & Denver City (FW&DC) Railway ("City" was dropped in 1951, thereafter simply FW&D.) About the same time, the Southern Kansas Railway, a subsidiary of the Atchison, Topeka and Santa Fe Railway, was building a line from Kansas through northern Oklahoma into the Texas Panhandle. These tracks terminated 24 miles northeast of Amarillo at a newly founded town called Panhandle City. In late 1887, Ft. Worth interests chartered the Panhandle Railway to build a 15-mile connection between the Southern Kansas at Panhandle City and the FW&DC at Washburn, 14 miles east-southeast of Amarillo. The hope was that with a connection to Ft. Worth, Panhandle City would develop into a major shipping point and ultimately become the principal city of the Texas Panhandle, but their hope was misplaced. Amarillo was served by rail connections to both Ft. Worth and Denver, and was surrounded by large ranches filled with bountiful prairie grasses. It is unsurprising that by the late 1890s it had become the principal city of the Panhandle and a major center for shipping cattle. In 1898, Santa Fe acquired the Panhandle Railway and obtained trackage rights from Washburn into Amarillo on the FW&DC. Participating directly in Amarillo commerce was an obvious motivation, but Santa Fe had bigger ideas. In 1899, the Pecos and Northern Texas (P&NT) Railway laid tracks from Amarillo to the New Mexico state line at Farwell. The P&NT had been founded a year earlier by James Hagerman, an investor and noted railroad attorney who had been employed by the Missouri Kansas Texas ("Katy") Railroad. [The town of Hagerman, Texas was named by the Katy Railroad in his honor, and the Hagerman Wildlife Refuge now occupies the shoreline near the former town site which was inundated by the construction of Lake Texoma.] At Farwell, the P&NT connected to the Pecos Valley & Northeastern Railway (also founded by Hagerman) which went to Clovis, then south to Roswell and Carlsbad, connecting to the Pecos River Railroad (also founded by Hagerman) at the Texas border and terminating at Pecos. [And if you speculate that there must be a Hagerman, NM somewhere along this route...you'd be right!] Pecos was served by the Texas & Pacific (T&P) Railway which provided a route to Los Angeles by way of interchange with Southern Pacific (SP) in El Paso. Thus, the connections through Pecos and Amarillo potentially served as a transcontinental alternative to Santa Fe's route from Kansas to the west coast via Raton Pass on the Colorado/New Mexico border. Santa Fe was developing their own plan to bypass the heavy grades of Raton Pass. In 1901, they acquired the P&NT as the first step, giving them a direct route from Kansas to Clovis via Amarillo (by way of trackage rights at Washburn.) Clovis was important because, in 1908, Santa Fe would open the Belen Cutoff across New Mexico from Clovis to Dalies where it rejoined their main line to the west coast. That same year, they extended the Southern Kansas main line into Amarillo, abandoning the tracks to Washburn and the FW&DC trackage rights. This essentially completed Santa Fe's transcontinental route bypass around Raton Pass. In 1914, the Texas operating component of the Southern Kansas Railway was renamed Panhandle & Santa Fe (P&SF), and this became the railroad under which Santa Fe's operations in west Texas would be consolidated. By this time, Santa Fe had already used the P&NT charter to build from the Amarillo - Farwell line at Canyon south to Plainview, further south to Lubbock in 1910, and another 200 miles southeast to Coleman in 1911. Additional branch lines had been (or soon would be) built, ultimately increasing the P&NT's rail network to 570 miles. Most of the P&NT was leased to the P&SF; it ceased to operate trains but continued to exist on paper, and was formally merged into the P&SF in 1948. In 1904, the last major railroad to enter Amarillo was the Chicago, Rock Island and Gulf (CRI&G) as it built through the area on a due west heading. Rock Island's purpose for this line was to extend their Memphis - Oklahoma City Choctaw Route west to Tucumcari, New Mexico where it would connect with their Chicago - Los Angeles Golden State Route. This Choctaw Route extension created a transcontinental route for the lower midwest that would attempt to compete with Southern Pacific's Sunset Route. In 1927, Rock Island built a line north from Amarillo to Liberal, Kansas which was also located on the Golden State Route. Although this provided two routes between Liberal and Tucumcari -- the Golden State Route via Dalhart, and the more southerly route via Amarillo and its westerly Choctaw Route extension -- the primary emphasis of this new line was to access agricultural commerce in vast underserved farming areas between Liberal and Amarillo. It appears that the 1908 extension of the Southern Kansas line from Panhandle City to Amarillo provided the impetus to establish the first interlocker in Amarillo. Tower 75 was authorized for operation by the Railroad Commission of Texas (RCT) on July 6, 1908, appearing in the list published in the 1909 RCT Annual Report as a 27-function mechanical plant serving a crossing of the FW&DC, the CRI&G and the Southern Kansas (which changed to "P&SF" in the 1915 report.) Details of the original tower structure and its location have not been determined. The concrete tower photographed by Barriger and many others was built in 1927. In 1929, RCT authorized a new interlocker, Tower 153, in the P&SF yards. Although no other railroad was involved with Tower 153, it was authorized pursuant to RCT policy that had evolved in the 1920s requiring that all interlockers be authorized, even those involving only one railroad. The P&SF yard interlocker established in Canyon in 1927 had already set this precedent for Santa Fe. RCT files at DeGolyer Library state that Tower 153 was a 12-function electric interlocker with controls located at the "Junior Yard Office", and that there was "no connection with a foreign line". 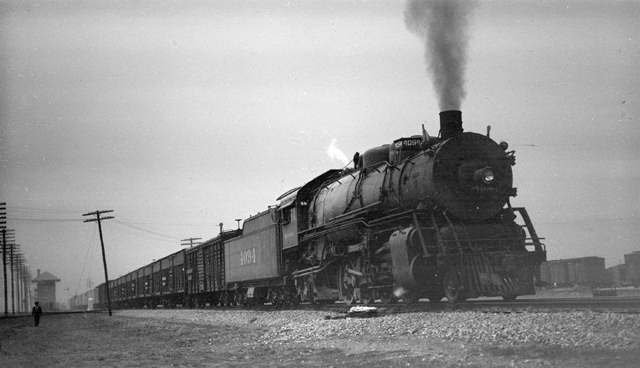 In 1931, Santa Fe built a new line north from Amarillo to Boise City, Oklahoma and beyond, passing through the Texas towns of Dumas and Stratford. This line split off the P&SF main line at "Dumas Junction" very close to where it crossed Rock Island's line to Liberal. Tower 177 was authorized by RCT for this crossing sometime in the early 1930s. The precise nature of the Tower 177 interlocking plant is unknown; the last detailed interlocker list published by RCT in 1930 ended with Tower 170. In 1955, a major expansion began at Amarillo Air Force Base (now Rick Husband Amarillo International Airport) when it was chosen to host B-52 bombers for Strategic Air Command. 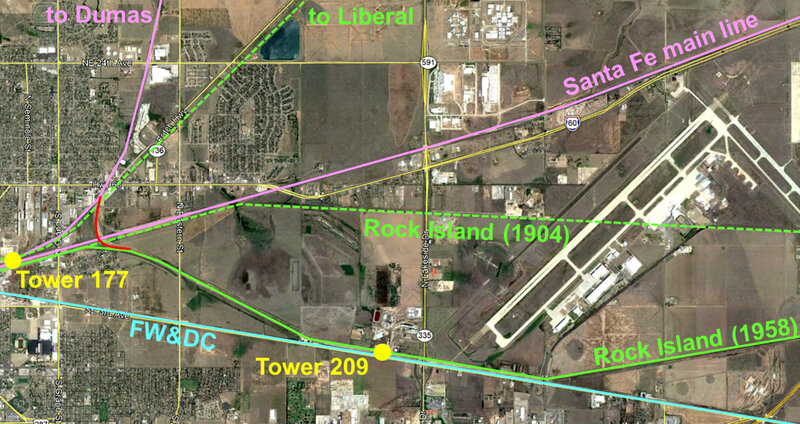 The base sat beside Amarillo's municipal airport and shared its runways. The Choctaw Route tracks were a quarter mile south of the airport; a new runway would cross directly through Rock Island's right-of-way. To relocate their line, Rock Island built new tracks east of the base that angled the Choctaw Route to the southwest all the way down to the FW&D right-of-way. It then paralleled the FW&D for two miles west before angling back to the northwest to rejoin the existing Choctaw Route approximately 1.2 miles north-northeast of Tower 75. Along the shared FW&D right-of-way, the newly relocated Choctaw Route crossed an existing FW&D spur that ran a short distance north. To protect this crossing, an "Electric Locked Crossing Gate" was placed in service at the spur track diamond on September 10, 1958. The next day, Rock Island wrote a letter to RCT requesting a numbered interlocker assignment. This request was later granted as Tower 209. This gate interlocker caused distant signals on the Rock Island to illuminate red whenever the gate was unlocked. Today, all of the surviving tracks associated with Towers 75, 153, 177 and 209 have been absorbed into Burlington Northern Santa Fe (BNSF). 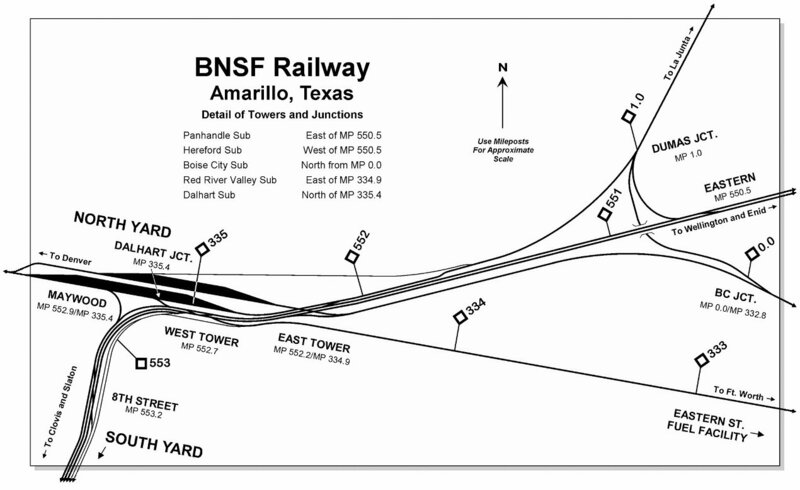 Above: This map details the track layout near downtown Amarillo in approximately 1955, with some additional details through 1965. The color annotations show the railroads and the interlocker locations. 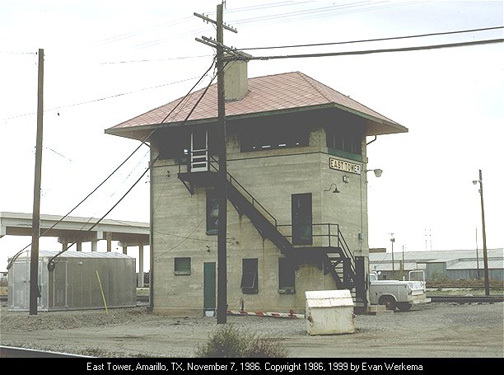 Tower 75 (East Tower) was the primary interlocker for Amarillo handling a junction of three main lines. 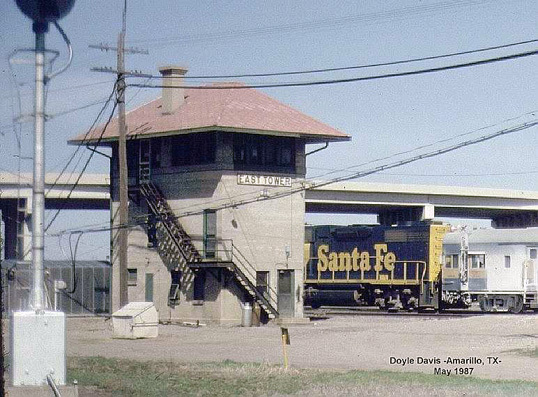 When the "New Junior Yard Office and Tower" was built in 1965 (presumably necessitated by the elevated I-40 freeway bisecting the yard), the Tower 153 interlocker was likely retired (if it was even still in operation.) 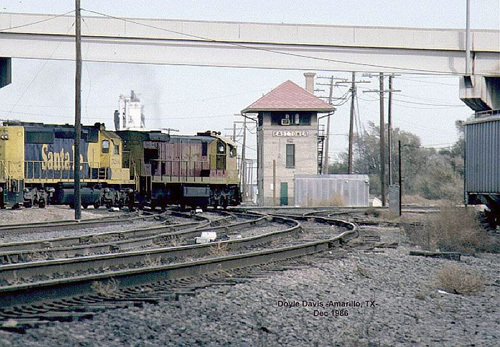 Tower 177 (Dumas Junction) was located where the P&SF line to Dumas crossed the Rock Island line to Liberal, KS. 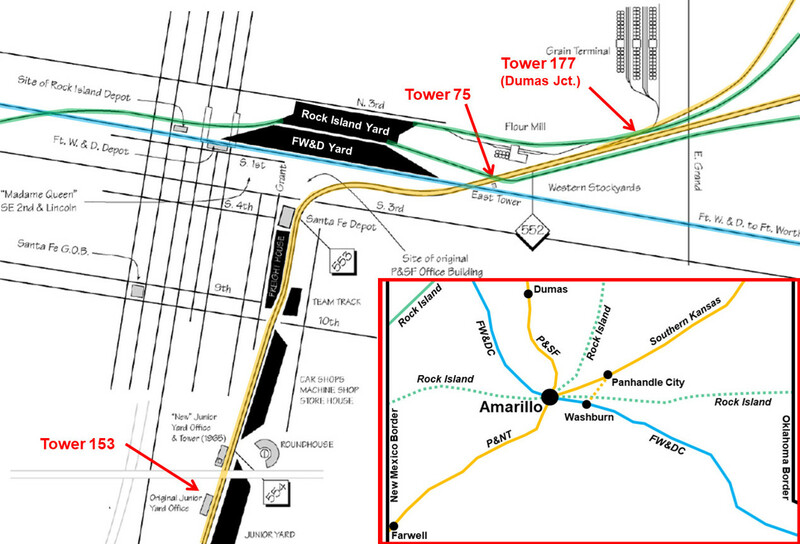 The inset in the lower right corner of the image shows the general heritage of Amarillo's rail lines. Tower 48 was located at Yarnall where the ex-Panhandle Railway line (acquired by Santa Fe) between Washburn and Panhandle City crossed the Rock Island. The solid lines all remain in service as of 2019; all of them are owned by BNSF except for the Rock Island line in the upper left corner of the inset which is now owned by Union Pacific. It was part of Rock Island's Golden State Route through Dalhart and Stratford, Texas. Below: Jeff Ford supplies this updated map from c.2006 with this explanation: "East Tower became part of a larger interlocking 'complex' in 1998 with the installation of what is referred to as West Tower. In 2005-06, the complex grew again to the west with the inclusion of a control point known as 8th St. In 2018, BNSF completed a fourth main track project which included work in the vicinity of East Tower where the Red River Valley sub Main 1 was reconfigured to run continuously into Hereford Sub Main 3, east-to-west." "The 15x30 tower was built in 1927 to a plan similar to the concrete interlocking tower standard plans shown on pages 218-221 of Santa Fe System Standards, Volume 2. The stairway, door, and window placement and other details deviated from the plan. ... The tower's duties diminished with the demise of the Rock Island. It was closed in April 1986 and demolished in mid-1990." Above: Since Tower 75 was authorized in 1908, the 1927 concrete tower must have replaced an earlier structure. 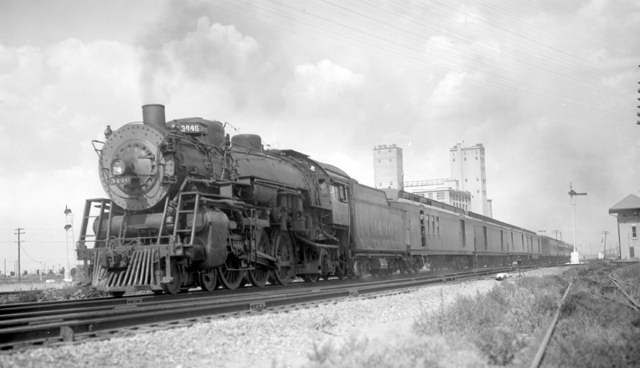 On April 8, 1953, the United States Court of Appeals for the Fifth Circuit issued a ruling in a case involving the Panhandle & Santa Fe (P&SF) Railway at Amarillo. The P&SF was the defendant accused of operating several train movements in violation of the Safety Appliance Act. The ruling includes this interesting description of the tracks and operations associated with East Tower. "As shown by a map of the yards, the defendant's classification yard, referred to as the West Yard, is located to the left, or west, of the major portion of the Amarillo Yards and the tracks of Fort Worth [and Denver] and those of Rock Island. The points where these lines converge and cross is protected by an interlocking plant, controlled from what is denominated East Tower. 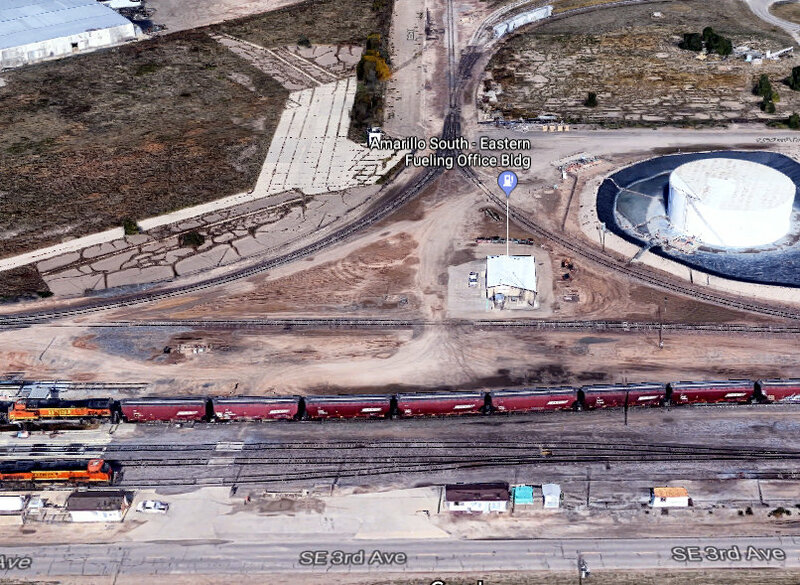 Beyond the interlocking plant, and some five miles from the classification yards of defendant on its Dumas Branch, is located the Amarillo Stock Yards. It is served by an industry track. Southwesterly of East Tower, and the point of convergence and crossing of the lines of the three carriers, is located the Western Stock Yard Corporation, some two miles from West Yard, or classification tracks, of the defendant. East of the point of convergence and crossing of the three main lines are the interchange tracks of the defendant and the Rock Island. These tracks are some two miles from the defendant's West Yard. Each of the movements here in question moved within the interlocking plant. The briefs tell us that an interlocking plant is a system or arrangement of levers, switches, lights and derails so interconnected that they must be arranged in a predetermined order for the selected movements of the plant. In the case of this plant, the movements are controlled by an operator in the East Tower who determines the priority of movement as between trains on the different railroads that attempt to use at the same time the area defined by the limits of the interlocking, and by manipulating levers indicates that fact by a system of lights. Rails which do not have priority are broken at points about 400 feet in advance of the crossings by means of what is called a "split-rail" derail." Left: These two copyrighted images are from historicaerials.com showing the re-location of the Choctaw Route caused by the expansion of Amarillo Air Force Base. 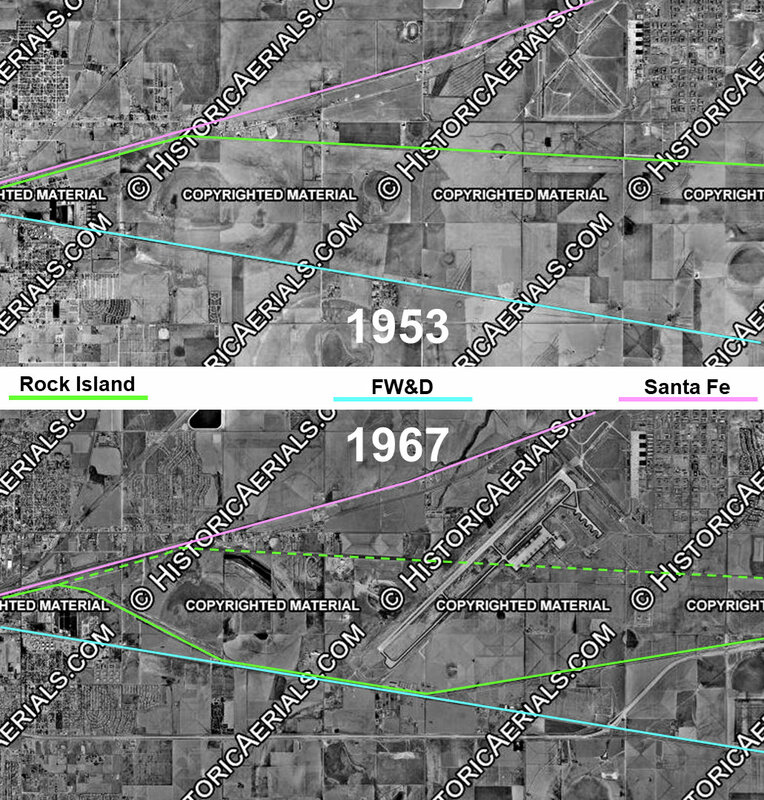 The upper image from 1953 shows the Amarillo municipal airport with the Santa Fe main line along the north side of the air field. The Choctaw Route ran parallel to (and a quarter mile south of) the south boundary of the airport. The Amarillo Army Air Field immediately east of the airport was a training center that shared the airport's runways. Closed after the war, the base was reactivated in 1951 as Amarillo Air Force Base and given a mission of training jet mechanics. In 1955, the decision to host operational B-52s at the base meant that a much longer runway would be needed. This required Rock Island to relocate its Choctaw Route tracks farther south. The new runway extended almost all the way south to the FW&D right-of-way. The lower image, from 1967, shows the abandoned Choctaw Route right-of-way through the base (green dashed line), replaced by new tracks that included a two mile section parallel to the FW&D. West of the runway, the Choctaw Route angled slightly more northwest and re-joined the original tracks where they paralleled the Santa Fe main line (before crossing over at Tower 75.) The precise date of Rock Island's relocation project has not been determined, but their efforts to establish Tower 209, where the new track crossed a FW&D spur, occurred in September, 1958. Since Rock Island took responsibility for resolving the interlocking issue for this crossing, it is reasonable to assume that they were the "second railroad" that created the crossing. Hence, this spur most likely already existed and the crossing materialized when the relocation project built across the spur, probably in the summer of 1958. Above: This consolidated view of the Choctaw Route project shows the location of Tower 209 where the new track crossed a FW&D spur. The re-located Rock Island tracks are still in use by BNSF. They terminate to the east just beyond the large Progress Rail Services freight car repair facility that sits between the Rock Island and FW&D tracks (served by both) visible in the lower right corner of the image. 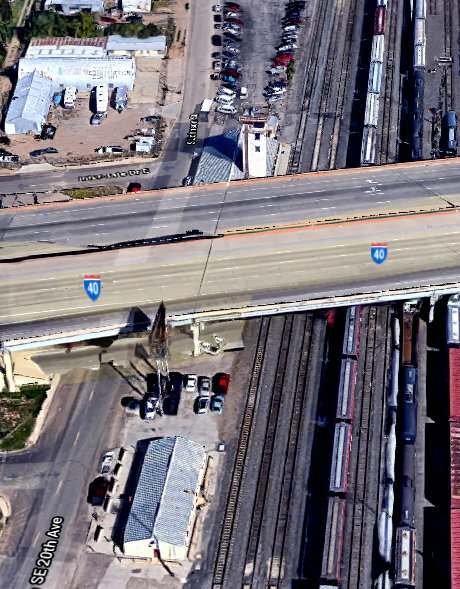 Where the Choctaw Route rejoined the Santa Fe main line right-of-way near Tower 177, BNSF built a new grade-separated connector (shown in red ) to allow traffic between the Santa Fe line to Dumas (BNSF Boise City Subdivision) and the FW&D line to Fort Worth (BNSF Red River Valley Subdivision) to bypass the Amarillo yards. 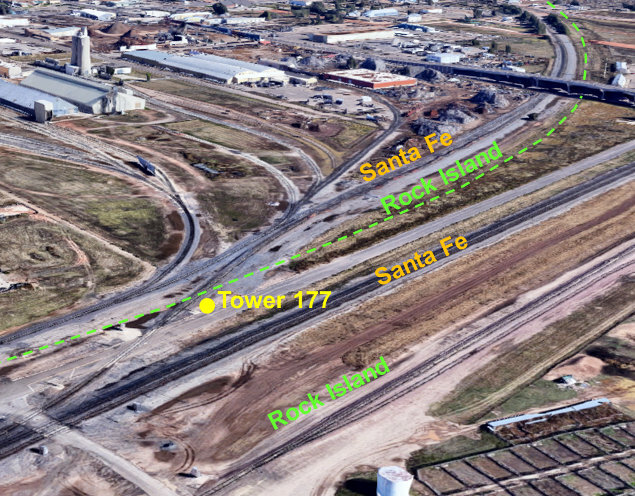 Above Left: This 2019 view of the Tower 75 site looks northeast along the Santa Fe main with the Tower 75 site in the foreground and the Tower 177 crossing 0.7 miles further distant. As the blue dashed line shows, the FW&D tracks no longer cross the Santa Fe main at Tower 75. Instead, they curve and join the Santa Fe main track going southwest (from westbound on the FW&D) or northeast (from eastbound on the FW&D). 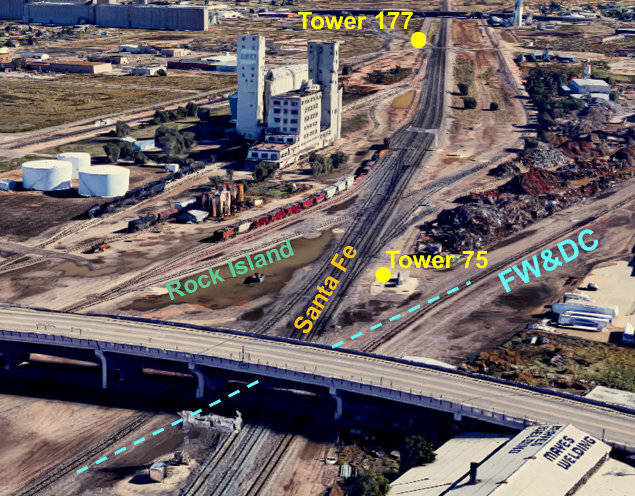 The former Rock Island track across the Santa Fe main at Tower 75 was put back in service c.2017. It curves due east past the tower site and parallels the main line to the point where the re-located Choctaw Route joined the Santa Fe right-of-way. 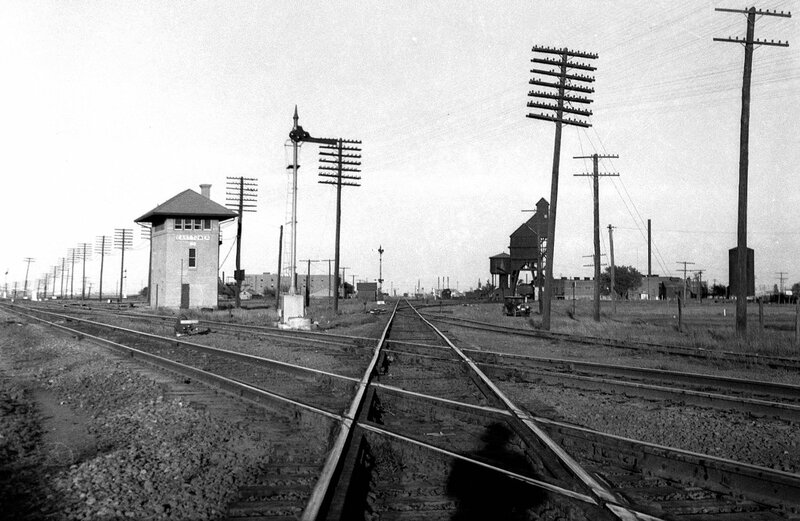 Above Right: Facing northeast, the Santa Fe line to Dumas split off from the main line, crossed over the Rock Island line to Liberal, and then paralleled it for about a mile. At that point they diverged, with the line to Dumas swinging north while the Rock Island line straightened to a northeast heading. Below Left: This north-facing image shows the wye-track industry spur that gave rise to the need for Tower 209 when the Choctaw Route was relocated beside the FW&D main line. The rail cars are essentially sitting on the Rock Island right-of-way while the other BNSF locomotive is on a siding of the FW&D main line. RCT files at DeGolyer Library show that the southwest leg of the wye actually connected to the FW&D main whereas the southeast leg only connected to the parallel track that is visible along the south side of the Amarillo South-Eastern Fueling Office Bldg. Tower 209's "Electric Locked Crossing Gate" was off the left edge of this image just north of the diamond where the southwest leg crossed the Rock Island. Neither the spur nor the industry area served by it appear on 1953 aerial imagery of Amarillo, but it certainly existed by September, 1958 when Rock Island requested an interlocker assignment from RCT. Below Right: The "Junior Yard Office" that housed the Tower 153 interlocker still sits beside SE 20th Ave. just south of the I-40 overpass (but is hopefully a newer structure than existed when the interlocker was authorized in 1929!) The new yard office and tower were built in 1965 and are visible immediately north of I-40. By the mid-1960s, RCT had ceased issuing new numbers for interlockers; automation had rendered their engineering design approvals largely irrelevant. The new tower was never numbered by RCT, and the precise fate of the Tower 153 interlocker is unknown. Last Revised: 4/17/2019 JGK - Contact the Texas Interlocking Towers Page.